Imagine leaving home and not knowing where you will stay or if you will eat. Imagine the fear of not knowing whether people at your destination will welcome you with open arms. Imagine that, despite this uncertainty, you must leave now in order to stay alive. It’s the fate of millions of refugees around the world, including the Basheer family in the Middle East and Djouleyatou Ousman from Central African Republic. 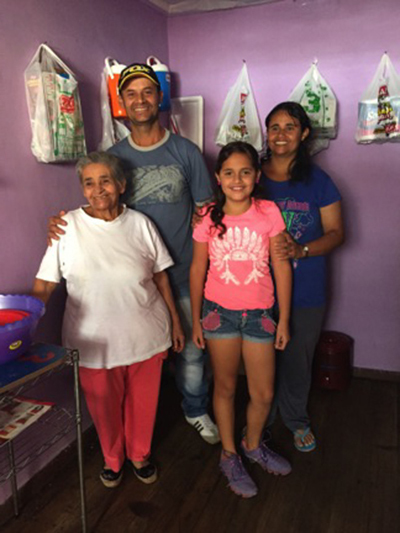 It’s also the story of Gustavo, his sister Martha, niece Luisa and mother, Clara. They are Colombian refugees living in Ecuador. Colombia’s six-decade-long conflict between the government and Revolutionary Armed Forces of Colombia continues to be one of the worst humanitarian crises in the Western Hemisphere. Armed guerilla groups, drug traffickers and human traffickers have forced millions of people—many of them poor—from their homes. Many have sought refuge in Ecuador. Refugee Council USA estimates that 250,000 Colombian refugees live in Ecuador. In Colombia, Gustavo was a watch and jewelry maker. Earlier this year, a group of men came into his workshop and demanded expensive gold and silver jewelry, but did not pay. Gustavo says they came back a few days later and demanded more, but he told them he needed money for materials. They assaulted him and sent a threatening letter to his home. Although he moved with his mother to his sister’s house, the same group—known for kidnappings and extortion—found him there. Gustavo knew he had to move right away. Without stopping by his workshop to retrieve his tools, he gathered his family and they took a bus to the end of the line, then found someone to take them to Ecuador. While receiving emergency assistance and shelter from HIAS, an American Jewish organization that helps refugees, Gustavo and his family linked up with the Scalabrini Mission, an organization that has collaborated with Catholic Relief Services for more than 6 years. Scalabrini Mission offers refugees legal support, counseling and financial advice. Colombian refugees face challenges that may include poverty, inadequate housing, domestic violence, lack of opportunities for young people, and lack of attention from local and national authorities. Scalabrini Mission’s goal is to help refugees integrate into society safely and well. “Even though we are living in adversity, we think of our family and friends. We want to join other people and share with them and live a normal life,” says Gustavo’s sister, Martha. Dr. Lucy Steinitz, CRS senior technical advisor for protection, met Gustavo recently. More than anything she wants him to get his tools back. “He’s a jeweler without his tools. He’s like a piano player with injured fingers. He’s lost his former life, but this makes it that much more difficult. If he had the tools, he could start over,” she says. A daughter of Holocaust survivors, Steinitz empathizes with Gustavo and his family. Her parents came to the United States as refugees. Her father had been a slave laborer in three camps during World War II. “Their trauma defined my childhood,” she says. “I feel close to stories about refugees. Gustavo's family is strong and future-oriented, she says. They have attended mandatory Scalabrini Mission workshops about psychosocial issues and gender-based violence. Gustavo’s 12-year-old niece, Luisa, has attended a children’s group. “Children should be happy. I want to be safe,” Luisa told Lucy. Gustavo says the sisters at Scalabrini Mission make him feel calm. “We seek people who are peaceful and patient, and who are concerned with our problems,” he says.